For most people born in the United States in the past half century tuberculosis (TB) is a disease you only read about in the history books, to which it was consigned by the development of antibiotics such as streptomycin in the aftermath of the second world war. However, the reality of TB in the world today is very different; this is a disease that still kills over a million people every year, mostly in developing countries. Many of these deaths are due to the way TB infects people who are HIV positive, indeed TB is a leading cause of death among people with AIDS. Current treatments are ultimately effective in most cases, but the treatment regimes often require the patient to take the drugs for up to 2 years, which leads to problems of adherence as patients – many of them poor – struggle to cope with the expense of visiting clinics and with the side effects of the antibiotics over the months of treatment. In addition to these deficiencies in the current treatment regimes, the HIV/AIDS epidemic has also seen the emergence of strains of TB that are resistant to currently available antibiotics, as HIV infection increases vulnerability to TB and standard TB therapies often interact badly with antiretroviral therapy for HIV, a development which threatens the hard-won gains made against the disease over the past decades. But thanks to animal research TB has a new enemy. A key ingredient in PaMZ is PA-824, a new drug that has not yet been approved by the FDA, and a novel aspect of the development of this therapy is that rather than seeking FDA approval for PA-824 on its own and then carrying out further studies in combination with other drugs, a lengthy process, the this therapy has been developed as a combination therapy with moxifloxacin, an antibiotic approved by the FDA for treating pneumonia and sinus infections and commonly used as a 2nd line treatment for multi-drug resistant TB, and pyrazinamide, a drug which has been used to treat TB since the 1950’s. This novel approach to drug development, which should shorten the development time for the multi-drug therapy be several years, was made possible by a recent change in the FDA regulations that is intended to make it easier to develop new combination therapies for infectious diseases and cancers. An added advantage is that licencing PA-824 for use only in combination with other anti-TB drugs will make it far more difficult for the bacteria will evolve resistance to it. This was only the beginning of the road for PA-824, further studies in both mice and guinea pigs – whose response to TB infection more closely mimics that of humans than mice do – demonstrated that it could eliminate TB infection at doses well below those that caused side effects. In combination with the ability of PA-824 to kill a wide range of drug-resistant M. tuberculosis strains in vitro, these results indicated that PA-824 was an excellent candidate for inclusion in a multi-drug combination pill for TB (1). Finally a study published in 2008 examining the efficiency of several multi-antibiotic combinations reported that a combination of PA-824, moxifloxacin and pyrazinamide could clear M. tuberculosis infection more quickly than the standard first line therapy (2), paving the way for the trial whose result was announced last week. 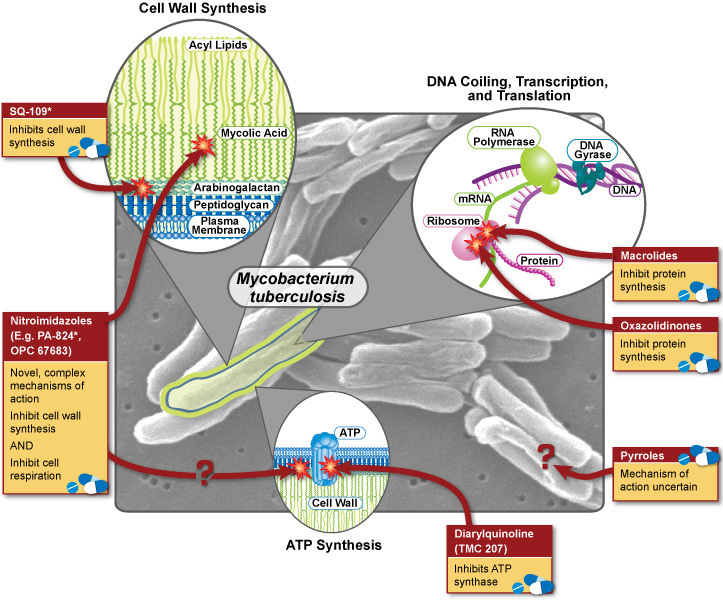 Posted on August 1, 2012 August 1, 2012 by EditorPosted in News, Science NewsTagged antibiotic, antibiotic resistance, bacteria, combination therapy, guinea pig, mouse, moxifloxacin, multi-drug combination, Mycobacterium tuberculosis, PA-824, PaMZ, pyrazinamide, streptomycin, tb, TB Alliance, tuberculosis.